When Zuo Ci is attacked, he can use any card as an escape face down. If the attacker believes that it is an escape, then it is used as an escape. If the attacker does not believe that it is an escape, the card is flipped. If it really is an escape, the attacker loses one blood and the escape is used. If the card was not an escape, the attacker takes the card and the attack is not escaped. When Zuo Ci is on the brink of death, he can discard everything to do a judgment. If it is not a club, he returns with three blood. Only the attacker can doubt what Zuo Ci stated. 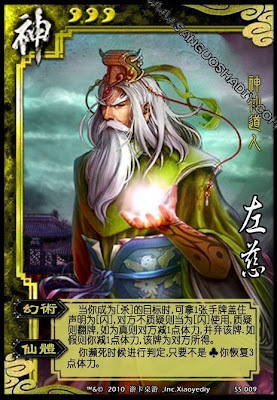 If Zuo Ci does not have any cards, he can still perform "Immortal".